Charlie and I don’t eat many land animals and no flying animals, but we do eat fish. That makes us pescatarians. So we had this the other day, and yum yum! 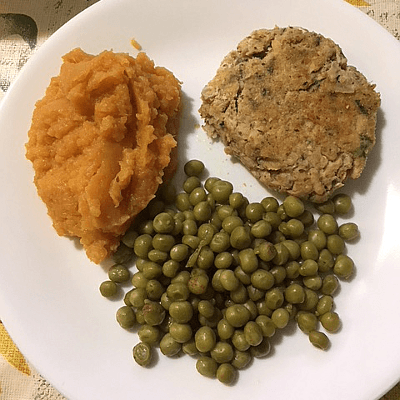 Mashed sweet pertaters, peas cooked with freshly grated nutmeg, and salmon croquettes–or, as we call them, salmon patties. When I make them–now don’t make that face!–I leave the bones in. We like to crunch ’em. Canned salmon, this is, not fresh. Fresh bones would prolly be a tad bit overcrunchy, I’m thinking. ANYWAY, I mix in an egg, dried dill weed, onion powder, salt, and breadcrumbs (usually Italian-flavored). Flavored with Italian-style spices, that is, not with Italians. So I let that rest a while so the crumbs soak up the egg, then I make patties, dredge them in more bread crumbs, and fry them in vegan margarine. I’m posting today at Fatal Foodies about a leftover stir-fry we enjoyed very much. A WRITING PROMPT FROM ME TO YOU: Write about a fish, dead or alive. This entry was posted in Food. Tagged pescatarian, recipe (sort of). This looks pretty good. I eat just about anything, but not a wide variety of seafood. We pretty much stick to salmon, tuna, tilapia, cod, and the occasional orange roughy. I’ll eat crab legs, when I can get ’em. And shrimp. I grew up eating tuna cakes, which are like salmon patties, only cheaper. I love them both, and now thanks to you have an idea about what we can have for dinner. Thx. Yeah, I like tuna cakes, too! When we have tuna, though, we usually have tuna salad or tuna noodle casserole. Excuse me, but if I might make a comment on behalf of Sweedie (the cat we lost a few years ago) and Buddy, my current felinic master…..
Ma’am, forgive us, but “and no flying animals”, well that would be birds. And, well CHICKENS, is birds, you know. And we edumacated members of the Feline Community, would like to ask WHY? At the same time, if you have any uneaten of these pests around, please feel free to send them to us. We are members of Local 1066, Avian Disposal Squad, (in good standing) and would like to let you know that we are always here to take care of such Emergencies. Always there to munch is our motto. They insisted I let you know of their FREE service. Cats are such noble creatures. I am owned by a cat, and he approves of this message. And HE says it is not a spam message. Chickens are not flying birds. They CAN fly, but not high and not far, so I don’t count them. Technically, my my own definition, I could eat emus, rheas, ostriches, and penguins, but I don’t eat them, either. My humble thanks to your cats, anyway. I am overwhelmed–or, at least, whelmed–by their nobility. They are VERY glad that the flight characteristics of a C H I C K E N (One sometimes has to spell things around here, if you know what I mean!) are somewhat less than those of a Sopwith Camel. The Aussies are very glad you are not moving there. They eat all those things, PLUS shrimp on the barbie… except maybe for the penguins. But that is because they would have to travel far to catch some. And Aussies like their stuff home grown. I shall pass on your thanks to my master(s). You need not be over whelmed, merely whelmed. And of course to take care of your cats. And emulate them with nobility.